The E Howard-Davies Youth Training Week is Back! This event is supported by the E Howard-Davies Memorial Fund. This training recently finished and was very successful! Read the full report here. 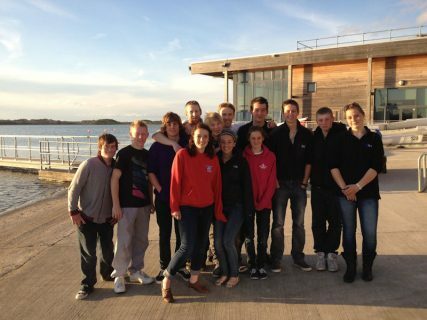 It was run by the Andrew Simpson Sailing Centre (ASSC) and with top guest coaches. Sailors were accommodated in the RYA’s Portland House. Twelve sailors were invited to attend. Applications were received from those who will be under 20 on 1 Jan 2017, or still in full time education. Although preference is to racers from our own fleet, it is not necessary to be already racing GP14s. Sailors are selected from those who can demonstrate racing competency and a desire to compete at GP14 championships. We can accept applications from individuals with a view to being able to pair-up helms with crews. The coaching is funded by the E Howard-Davies Memorial Fund, but sailors are expected to cover the cost of accommodation, food and any evening activities. Sailors will need to be members of the Association. House parents stayed at Portland House to look after the Under 18s when they are not at the ASSC. Whilst we expect most helms will want to use their own boats, it may be possible for us to arrange boats in special circumstances.